This week, you can watch as Earth passes a threshold not seen for at least a million years. 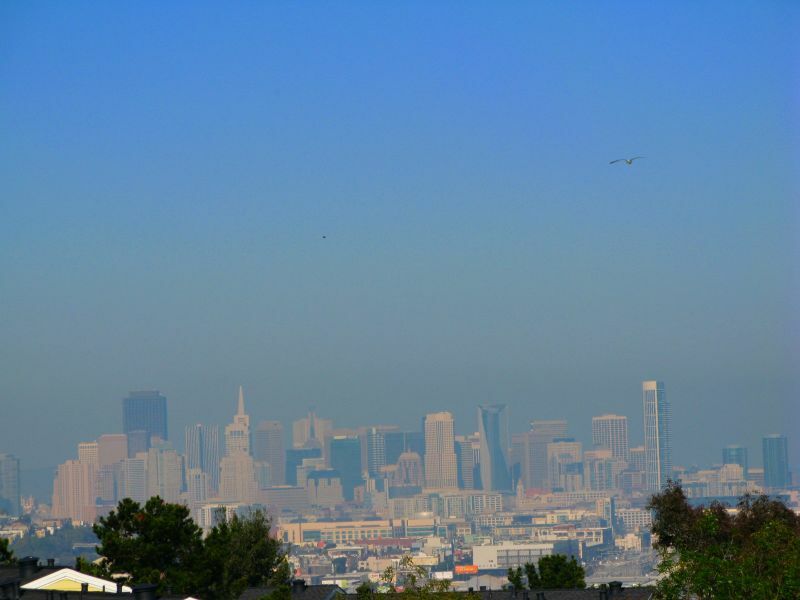 The concentration of carbon dioxide in the air will rise above 400 parts per million. And scientists predict neither you nor your children will ever see it go below 400 ppm again. The World Meteorological Organization (WMO) said on Monday that this year's El Niño combined with global warming puts the world "in uncharted territory." “This naturally occurring El Niño event and human induced climate change may interact and modify each other in ways which we have never before experienced,” said WMO Secretary-General Michel Jarraud. 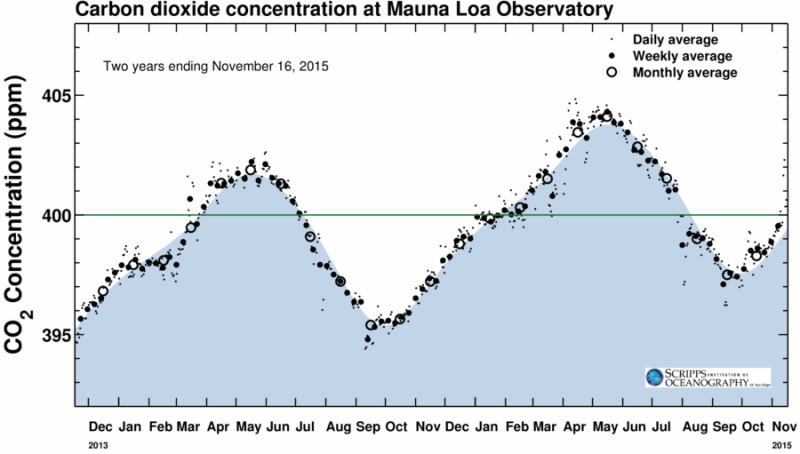 When scientists talk about atmospheric CO2, their yardstick is the so-called Keeling curve. 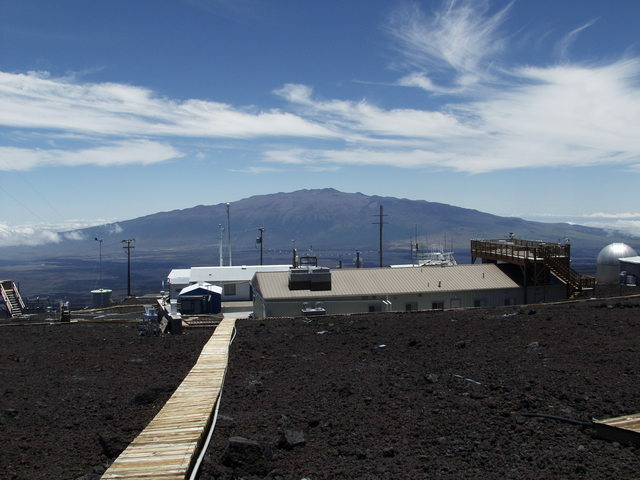 It's the record of the air's composition, made each day at a station run by the Scripps Institution of Oceanography in the pure air high on Mauna Loa volcano, in Hawaii. Ralph Keeling, the custodian of the CO2 record, made his prediction last week in a blog post on the Keeling Curve website. The Keeling curve was started in 1958 under the direction of Keeling's father, Charles David "Dave" Keeling. Today it's the longest series of such measurements in the world. It was named a National Historic Chemical Landmark this year. 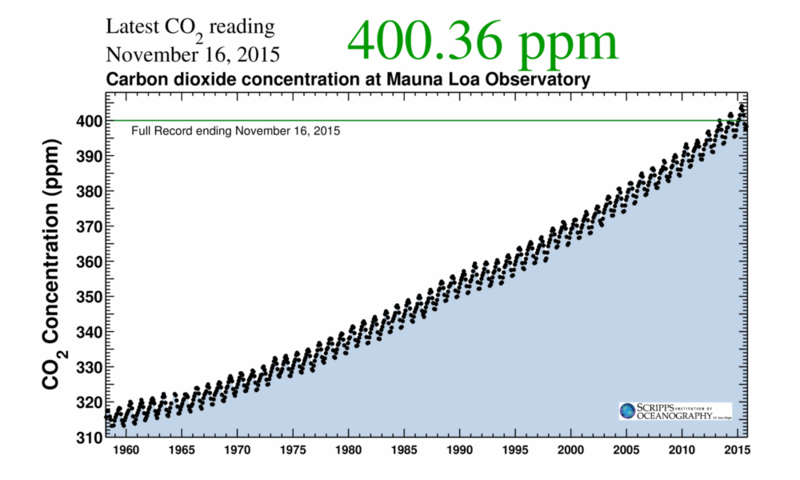 The Keeling curve is an icon of climate change. What does it show? In the 1960s, Dave Keeling's measurements showed that the CO2 level in the air was rising steadily. That long-term increase is the mark of human influence. It comes overwhelmingly from the fossil fuels we burn -- largely to generate electricity, but also to smelt metals, produce cement, run motors and so on. Other smaller sources of CO2 are from humans cutting down forests and from large-scale mechanical farming, which removes most of the carbon-rich humus contained in soil. Since the 1960s, the long-term increase in CO2 has sped up. A little over half of the CO2 we produce is absorbed by the ocean and by growing plants. The rest stays in the air and acts as a greenhouse gas. If CO2 weren't a greenhouse gas, we might welcome it for promoting plant growth. But because it is one, higher CO2 levels will make Earth steadily warmer until either human ingenuity or geology can bring them back down. What led to Ralph Keeling's prediction, and the significance of this week? That stems from another of Dave Keeling's early discoveries -- the CO2 curve also goes through a yearly cycle, rising to a peak around May and falling to a low around October. The yearly cycle is a signal of natural life. Plants absorb CO2 from the air during the growing season, then release it as they are eaten or die back. Because most of Earth's land area is in the northern hemisphere, the yearly cycle is dominated by the seasons in the north. But this year we have a record-breaking El Niño in the cycle, triggering drought in the tropics and hampering plant growth there, and fueling widespread forest fires that pour CO2 into the air. The forest grows back, but not in time for next summer. So Ralph Keeling predicts the annual summer dip won't bring readings back down into the 390s, as it did in 2014 and 2015. 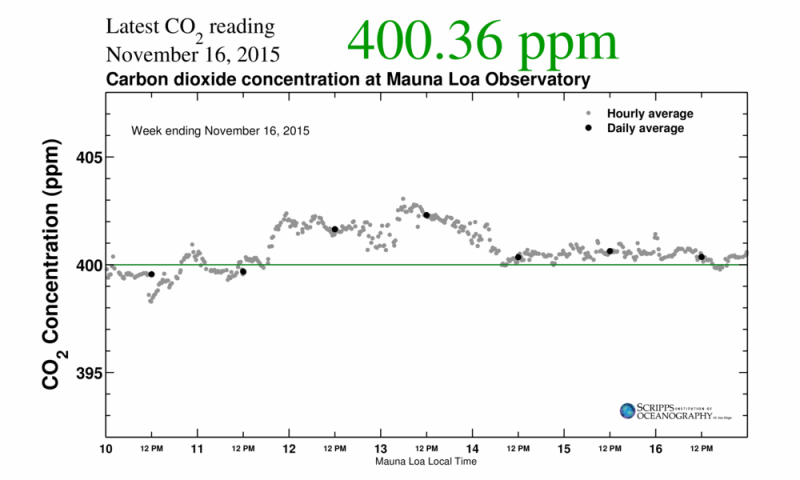 "Will daily values at Mauna Loa ever fall below 400 ppm again in our lifetimes?" Keeling asked. "I'm prepared to project that they won't, making the current values the last time the Mauna Loa record will produce numbers in the 300s." Meanwhile the stubborn long-term climb caused by humans shows no sign of slackening. Change Can Happen, But Are We Willing? In the 1700s, before coal began to be burned for industrial processes, CO2 was at about 280 ppm. The long-term upward trend has never gone down since the Keeling measurements began. The only way to make the climb stop is to burn less carbon and, at the same time, fix more carbon. Burning less means changing our economic system severely and rapidly. It can be done, but the change will be profound. Fixing more carbon is a project with many options, most of which involve burying CO2 underground. One promising frontier is working with the natural carbon cycle to increase the world's biomass. Restoring the soil, by reforming our farming practices, could help turn the Keeling curve back toward 400 and below, once again. That, too, would be a profound change. Eventually, geology will take care of the atmosphere through the really long-term carbon cycle. First the ocean will stir excess CO2 throughout its deepest waters. That will take on the order of 1,000 years. Second, the erosion of rocks will fertilize the sea with dissolved carbon minerals, which plankton will use to make their microscopic shells, which will fall to the seafloor as the plankton die and be buried. It's a roundabout system, but that's how the Earth works. That will take many thousands of years. We probably can't wait that long.